The Giver, directed by Phillip Noyce and starring Jeff Bridges and Brenton Thwaites, premiered on August 11, 2014. It received a People's Choice Award nomination for Favorite Dramatic Movie. It received generally mixed reviews from critics. 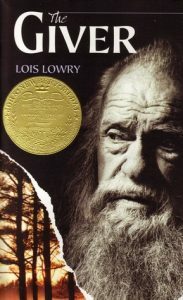 If you like Lois Lowry's The Giver series, check out these other titles for young adults. Celestine North lives a perfect life, in a society in which perfection is paramount and flaws are punished. She's a model daughter and sister, she's well-liked by her classmates and teachers, and she's dating the impossibly charming Art Crevan. When she breaks a rule, she faces life-changing repercussions. In Saintstone everyone gets tattoos recording their deeds from birth until death, and the ink lets every other citizen know your triumphs as well as your sins; so when Leora's father dies and she sees glimpses a symbol of a horrible crime on the back of his neck she is horrified, and sure it is a mistake--and in her efforts to find out the truth she discovers the lengths that Saintstone will go to preserve its "perfect" society. View more suggestions for The Giver.